Lynx (cat) is the main protagonist in this game, you only need to beat up those dragons. To beat up those dragons, you need to be stronger. Do not upgrade other allies, skills, just upgrade your lynx just focus only on your main hero Lynx. Once you passed a stage, you cannot go back to that stage or any stage except for the current next stage. So becareful when using your coins, because if you fail the stage you will only get a small amount of coins. If your are experiencing difficulties in early stages (below Stages 30) such as using consumable items or fail many times, you should create another game. 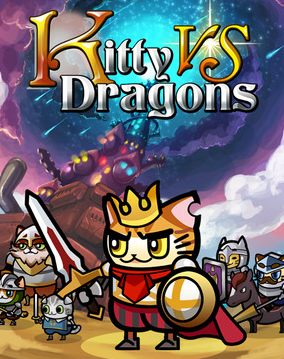 Kitty vs Dragons had a total levels of 60 and the difficulty arises at level 40. Your main objective at below 40 stages is to put your all coins to lynx level upgrades (Not lynx skills). Since you cannot go back to previous stages, it is important that your all cost coins is used for later stages. A high level lynx can survive without any help of allies or consumable items. Coin gains are increasing per stages, consumables items at early stages are too costly. Do not also use consumable items just stack and save them for 40 above levels. Light blessings is the best skill of lynx, upgrade it when you passed at level 40 but do not over upgrade it. Get fire trap if you have a lot of coins, do not upgrade it because fire trap will slow the dragons. Bastet Idol are somehow useful (Slow effect to the enemies with knockback) but it cost 3000 so it depends on you and still you can finish the game without it. Food bowl is useless if you are only using Bishop Pard and a few allies that cost 50 above, it cost 10000 so it is a big no. Ally slot and skill slot are useless and very costly. In ally slot you need atleast bishop and one allies, the rest are optional. In skill slot you only need Light of blessing and one attack skills like gust of wind. After you passed the level 40, you can use your consumable items such as Feral scroll or Ailur. Use them if you are experience difficulty and your coins are near or almost required coins for the next level. Do not use them if you recently upgrade your level just save them for later use as the Feral scroll cost is 2000. Save moonstone for later stages and it cost 1500 so use it wisely. Upgrade your light blessing to level 1-4 for 40-50 stage, then 4-7 for 51-60 stage. Every upgrade of light blessing increases the heal and the duration of your shield. The duration of level 7 is almost the same of light blessing cooldown WHEN using FERAL SCROLL. So save your feral scroll for later levels. Gust of wind level 1 is your secondary skill, it is useful for knocking back enemies and deals good damage to ranged dragons as they have low hp but high damage. Buy feral scroll for 52+ stages if you don't have feral scroll anymore. Level 15+ lynx can easily beat any level so reach that level as soon as possible.